lowepro flipside 400 aw. Condition is used. Bought it years ago for a trip, used it and then sat only at home storing my equipment. It never going out, since I never needed that much room at the same time. As can be seen in the photographs the wear is minimal, and I’ve reduced my equipment, so it doesn’t even get filled up at home. Hope somebody enjoys it, it’s really comfy and protected. Pro DSLR with lens attached (up to 300mm f/2.8);. 4-6 extra lenses;. Velex, 210D Nylon, Tricot. Interior Fabric External: 30.3 x 25.3 x 46. · DSLR with up to 300 mounted lens or compact drone. · CradleFit™ pocket suspends and protects 15” laptop and 10” tablet. · Padded waistbelt and adjustable sternum strap help distribute weight evenly. Load in your DSLR with 7 lenses, or a compact drone, as well as a compact tripod and 10” tablet and 15” laptop. This includes sealed boxes, or sealed accessories and manual/software included in boxes. Organize gear with the padded, touch-fastening, interior dividers. The back panel is padded for cushioned comfort and improved cooling airflow. Load in your DSLR with 7 lenses, or a compact drone, as well as a compact tripod and 10” tablet and 15” laptop. DSLR with up to 300mm mounted lens or compact drone. Padded waist belt and adjustable sternum strap help distribute weight evenly. Load in your DSLR with 7 lenses, or a compact drone, as well as a compact tripod and 10” tablet and 15” laptop. This may be because you made an impulse buy or simply chose the wrong item. It is not a "try before you buy period". Part: LP37129. All Weather AW Cover and coated materials combine to provide protection from the rain, snow, sand and dirt. High-capacity dynamic storage system adjusts to fit a wide range of gear from DSLR & lenses to hand-held gimbals and compact drones. Marke Lowepro. Our expert staff provides advice and assistance to the side and looking for the right solution for you with you, even if it's not in 15 minutes. We also advice is still capitalized. In November, you can check on our annual in-house exhibition in Nuremberg, Germany on all products in the field of photo, video and digital. Review Lowepro 400 AW. IN THE BOX. Weight 2.8 lb / 1.3 kg. Interior Material Foam, Nylon, Tricot. Review Lowepro 400 AW II. Padded Interior Top Pocket. Waist Belt Adjustable waist belt with quick-release buckle. IN THE BOX. Weight 3.3 lb / 1.5 kg. MICA/camo camouflage. Two elastic side pockets for quick access to water bottles, etc. designed for modern living. Access through the back with different lenses for digital SLRs. Sliplock ™ system compatible belt on the outside for extra storage. Item model number: LP37130-PWW. Boxed-product Weight: 1.7 Kg. Padded waistbelt and adjustable sternum strap help distribute weight evenly. We're happy to help. Unless stated otherwise. We will do our best to turn any less than satisfactory experience into a positive one. Product Details. 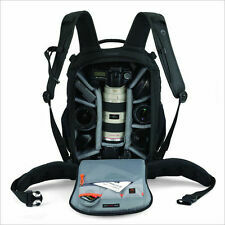 Lowepro Flipside 400 AW II Camera Backpack - Black . We will do our best to turn any less than satisfactory experience into a positive one. We Always Provide The BEST SERVICE! The Lowepro Flipside 400 AW is a multipurpose backpack that is useful for many different scenarios. The materials that make up the backpack make it a highly durable item. For an affordable price, you can purchase this backpack online from eBay. What are the primary features of the backpack? The primary features of the Lowepro backpack include numerous compartments as well as a flip-side design that is meant for protecting items in your bag. For support, it uses the ActivZone suspension. This allows you to wear the backpack for extended periods of time while keeping your shoulders comfortable. There are also plenty of attachment points along the top and bottom of the bag so that you can carry gear outside of your bag's compartments. What materials are the backpack made from? There are numerous materials that make the Lowepro backpacks useful for carrying items that need snug and compact environments. Many of these compartments are made out of air-mesh padding. This padding provides a snug setting in which to place a delicate object such as a laptop or tablet. The padding can help protect your important objects from falls and keep them from being damaged. The YKK zippers included on each backpack are both durable and easy to use. In order to protect objects inside the backpack from external forces such as weather, there is an AW cover attached to the bag. The cover keeps objects both dry and at a moderate temperature. What are some uses for the backpack? As a backpack, the primary use for it is to help you lug your items around. This particular backpack was designed to carry various camera parts and keep them safe during travel. You can also use the backpack to carry other objects such as a laptop, tablet, or Kindle. Other compartments allow you to put smaller objects such as an iPad, phones, or writing utensils. If you're out hiking or rock climbing, the Lowepro backpack is a great accessory to bring with you. The ActivZone support can rest on your shoulders for a long time as you carry larger loads of equipment. You can use it to carry binders and books for school-related activities, too. What colours/designs does the backpack come in? Content provided for informational purposes only. eBay is not affiliated with or endorsed by Lowepro.